Are You... Liberal? 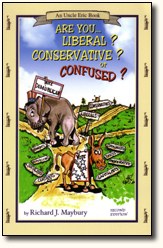 Conservative? or Confused? Political labels, what do they mean? What are their economic and legal policies? How do they affect your business, career, and investments? Liberal, conservative, left, right, democratic, republican, moderate, socialist, libertarian, communist—what are their economic policies and what plans do their promoters have for your money? Clear, concise explanations. Facts and fallacies. This is essential knowledge for all educated persons.